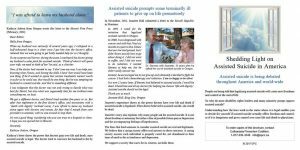 April 2017—Shedding Light on Assisted Suicide in America counters the myths that assisted suicide laws are safe and without abuse. It explains how the assisted suicide laws in Oregon and Washington State work and why they provide no effective oversight. Order by calling 1-877-439-3348 or email info@epcc.ca.